Semi-Wholegrain Sunflower Seed Sourdough Bread! 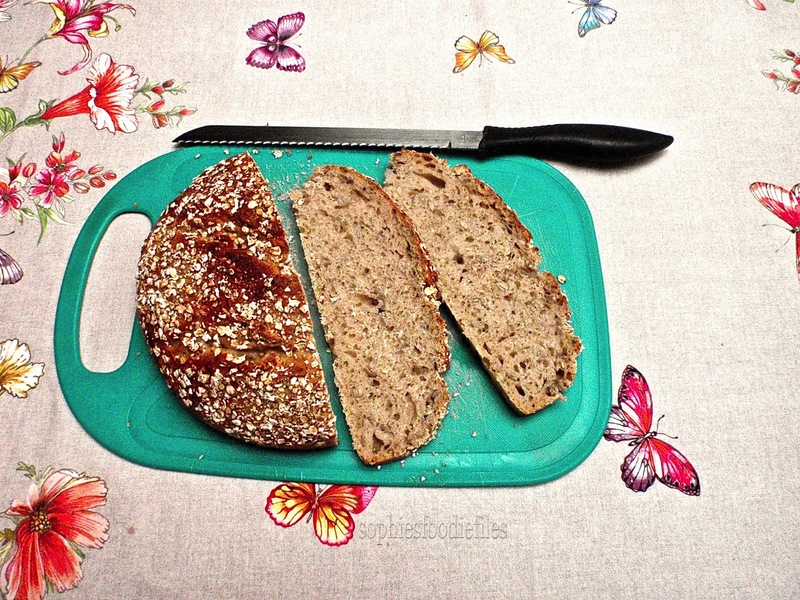 Recipe: For 1 sunflower seed sourdough bread about 870 gr! 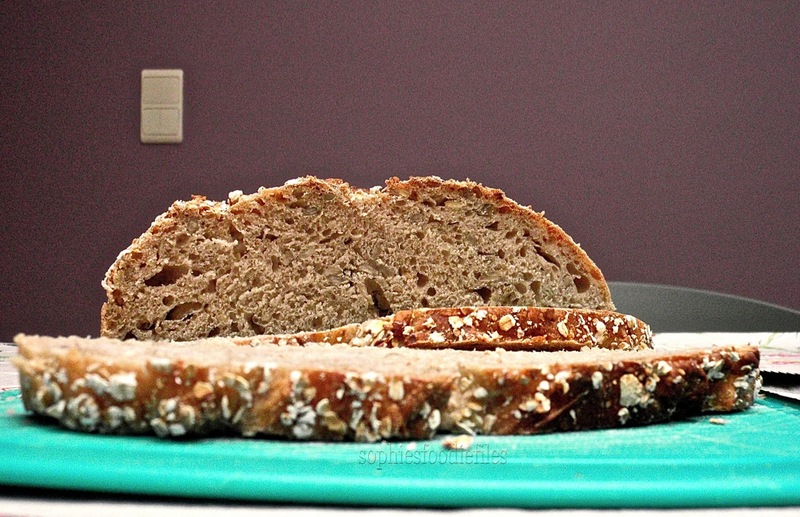 to top bread with: brush with water & sprinkle oats on top & sides! The day after, the next morning. Make the final dough! Take the bowl of your Kenwood machine & place your starter & the rest of the ingredients in it. This is the 200 gr T 110, the 100 gr T 65, the 25 gr sunflower oil, the 80 gr sunflower seeds, the 130 gr lukewarm nearly hot water & the 5 gr table salt. Place the dough hook in your machine & knead the dough for about 10 minutes on medium-speed. You will end up with an elastic dough & that is what you want. Flour a bit of the T 110 flour onto your kitchen counter but not much. 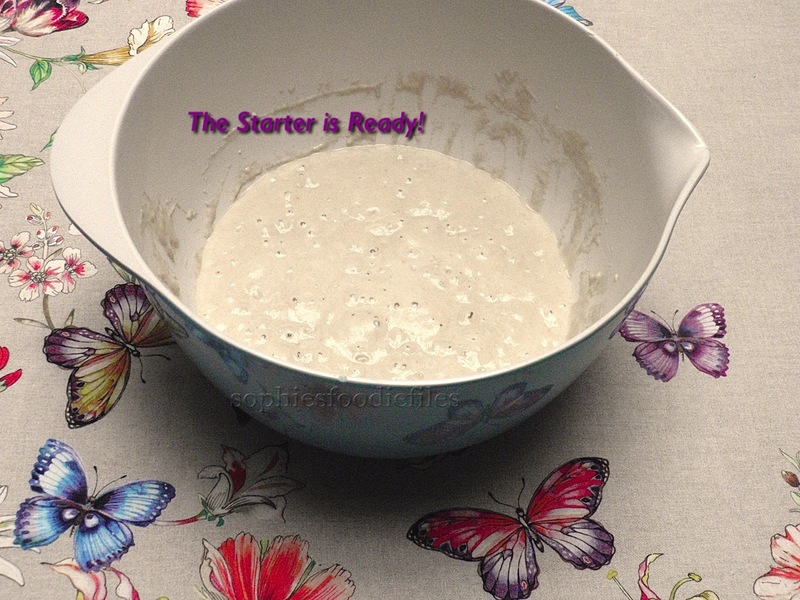 Take all of your kneaded dough out of the bowl & knead it for 1 minute. Form a roundish shape & place it into a sunflower oiled bowl. Place a fitted plastic bag over it & tie it. Place onto your kitchen counter or into a warm place & let it rise for about 4 hours. This is the 1st rise! In this 1st rise, after 90 minutes, fold the bread on all sides, from the sides to the middle & let it rest further on. Then, flour kitchen counter with a bit of the T 110 flour. Take the plastic bag off & place dough onto your kitchen counter. Knock back all the air & form a roundish shape. Place the risen dough into your final bread baking tin. I used a metal round baking tin. I greased it with sunflower oil & placed my round bread in it. I brushed the top & sides with water & sprinkled oats on it. Place into the plastic bag again & tie it. Leave to rise for the last & 2nd time for about 3 hours. The dough is ready to be baked, when you push your finger into the risen dough, you see the print for a bit & then the dough slowly goes back to its form. Preheat your oven to 180°C (350 °F) for 10 minutes &place 1 oven rack on the low-bottom tray in your oven. Also place a ceramic small oven dish in it. I always use a fan oven! Now, put your risen bread in bread tin onto the low oven tray & pour just boiled water into the ceramic dish. Close oven door & bake the bread for 20 minutes on 180°C. After this time, check bread top. If it is too brown, lower temperature to 160-170°C & bake for another 20 minutes. When ready, your bread will smell amazing. With oven gloves on, take bread tin, out of the oven. Carefully, flip out your bread. Tap on the bottom to see if our bread has been cooked through. If it sounds hollow, you are there. If not, place it back into the bread tin & bake for another 10-15 minutes. Place onto a wire rack to cool down completely! When cold, store into a bread bag. Enjoy! 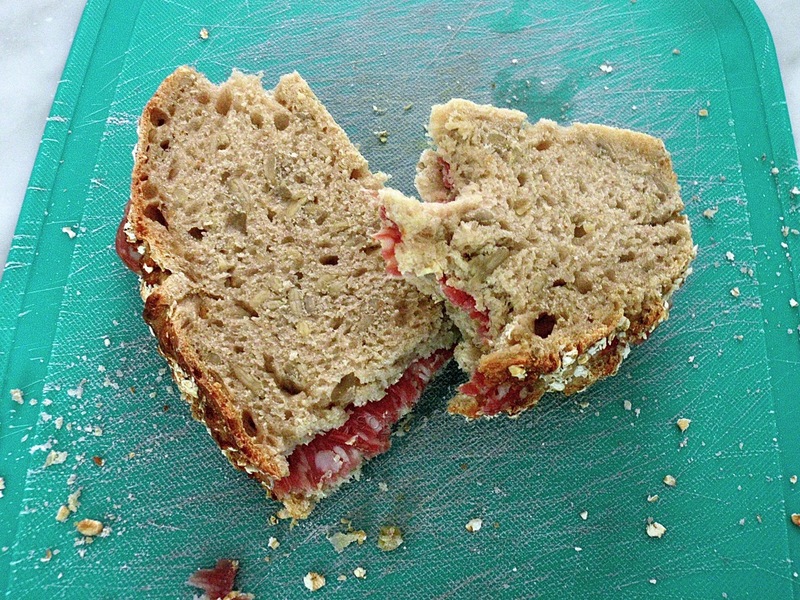 This bread is so yummy smeared with butter & then topped with some lovely salami slices! Yummm! Semi-Wholegrain Sourdough bread baked in a closed Creuset pot & with dry sourdough! Previous Post Vegetarian Pantry Salad!!! Next Post Quick Seasonal Pasta! Thanks so much, sweet Rhonda! A fantastic amazing sourdough bread! Cool!